However, there is a “sweet spot” for the government, in the 2018 tax brackets, where some people aren’t going to see a cut. So if you are filing single in 2018, the government may be giving you a little incentive to find a dance partner. Below is a model that I built so that you can see how the different rates stack up. For the single filers, keep your eyes on the old 33%-39.6% rates. In the past they were bunched up together, but now they are proposed to be split up more. Basically, what is happening is that in the old plan for 2018 you would have spent more time in the 33% bracket, and now you are spread into the 35% bracket for longer. Confused? You should be, didn’t President Trump say that we were going to be able to do taxes on a napkin? Well, no surprise it isn’t much less complicated that it has been for the last several decades so here is a model that you can use to see your situation. If you are one of the lucky filers in the top 1%, you can change the yellow highlighted sections to get a better estimate of your taxes. I mainly deal with medical professionals so I am going to discuss the married couples filing jointly chart in the top brackets. What kind of tax savings would an Oral Surgeon, Orthodontist, or Plastic Surgeon see? When I’m appraising those kinds of medical practices I typically see income in the $700,000 to $1 Million range, so let’s focus on the $1M section. Under the “old” tax brackets these people would have crossed into the 39.6% tax bracket starting with their $480,051 dollar. So the first $480,050 was taxed at around 28%, or $134,244. The next $519,950 is taxed at 39.6%, or $205,900. Total Tax under the 2018 “old” tax brackets: $340,144. You can see with our progressive system the first dollars that you make are taxed at a “discount” to the last dollars that you make. Your first $600,000 is taxed at about 27%, or $116,998. The next $400,000 is taxed at 37%, or $148,000. So combined the $1,000,000 income is going to be taxed at a total of $309,379, or a tax savings of $30,766. Not enough to hire a new assistant full time, but hopefully enough to send one of your children to college for a year. The government is betting on economic growth, perhaps this tax savings will convince you to upgrade some of your technology. This would be enough to pay for a new office server, new office computers, and 4 K monitors for everyone. However, it isn’t enough of a tax savings to get you a new Conebeam. Although, it would make for a nice down payment on one. 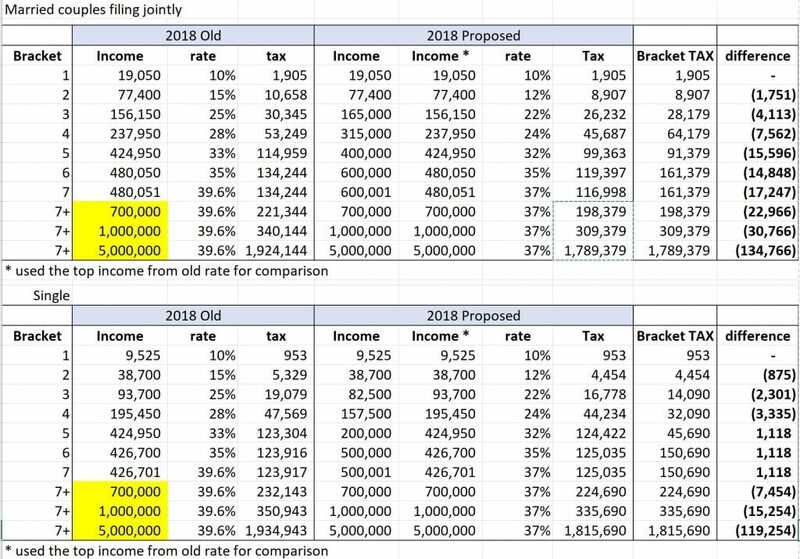 What tax savings would a general dentist expect from the proposed 2018 tax brackets? Most of appraisals that I do for general dentists show their income from salary and profit between $400,000 and $700,000. Let’s look at a dentist with an income of $424,950. Under the “old” tax rates they would be at the top of the 33% bracket and would pay $114,959 in taxes (progressively around 27%). In the proposed 2018 tax bracket the dentist would be at the bottom of the 35% bracket, but most of their income would have been taxed at about 23% as they progressed up the tax brackets. These dentists are looking at a tax savings of $15,596. Perhaps this year you should add a day of hygiene to your schedule. Maybe it is time to get that digital panorex that you have been putting off. Aren’t there more aspects to Trump’s Tax Plan? Is the estate tax/death tax going away? Well no, but they did double the threshold from $5.49 M to $10.98 M. Personally, I’ll lose a bit of business as more and more estates fit into that extra threshold. I’m on board with this change although, I wish it would have gone away completely. The government has already taxed them their entire lives, then they want to tax them another half or so just because they died? I recently wrote an article on the estate tax. Don’t they phase out certain deductions at certain income levels? Yep, good luck figuring that out! Isn’t the standard deduction going to go up? Yep for a married couple it will go from $12,700 to $24,000. The good news here is that means that if you currently itemize you may be able to save some time by just taking the standard deduction. Personal Exemptions go away. OUCH! That was 4,050 per person. So if you have 3 people in your family, the jump up in standard deduction is wiped out. 4 or more people, well let’s just say you aren’t that happy with the plan anymore. Costal/blue states aren’t going to like that state income taxes are capped at $10,000. Perhaps it’s time to start voting against tax hikes in your states? Child Tax Credit is going to double to $2,000. This will help take out some of the sting from losing the personal exemptions, that your children otherwise would have had. Cap on home mortgage deduction from $1,000,000 to $750,000. We will probably see a bit of a dip in prices for houses between $1.2M and about $900,000. The penalty for not having healthcare insurance is gone. I’ll probably do a post or vlog about this at some point. Personally, as a self employed family we have been given the shaft by Obamacare for several years. Our premiums quadrupled, our deductibles tripled. It was like we didn’t even have “coverage” anymore until we had paid something like $30,000 a year. So we moved over to a Christian health sharing plan. Corporate tax rate is going from 35% to 21%. We need this to compete globally. This one works for me, bring the money back and build your factories here. Completely against the theme of doing your taxes on a postcard, the proposed changes complicate life so much. Some accountant will come up with the perfect scheme to defeat the idea behind this, so be prepared to pay larger cpa fees in 2018. So pass through profits are going to go down to a taxable rate of 20%, unless you are in a service business, unless your income is less than $315,000 (married). Complicated enough? See any possible issues or loop holes? When you run a pass through business you are required to characterize a portion of your profits as salary. That salary has a definition/guidelines as to how much that should be. As an example, let’s say you are a General Dentist and you have $400,000 in profits. $50,000 in W2 earnings, $350,000 in profits. They would say to this doctor, “so you go to work for 4 days a week and work 9 hour days and you take home around $1,000 a week. Can I hire you to work in the IRS offices?” Nope! You are caught, with your hand in the IRS cookie jar. Prepare for some massive fines. $250,000 in W2 earnings, $150,000 in profits. Ask yourself, “would I go to work for 36 hours a week at the practice across the street if they gave me $250,000 a year?” Insert the hours you work and change around the dollar amount until you feel like that would be a good deal for you. This number needs to be enough for you to wake up in the morning and go to work for someone else, knowing you no longer have to deal with any ownership responsibilities. It isn’t going to be a fun situation at all. Keep in mind that if you are a passive owner in the business, you aren’t going to take a salary at all and are just going to take profits which will be taxed at 20%. Are we going to see massive transfer of companies to kids, and other relatives? If my son passively owns my business and gets taxed at 20%, then couldn’t he pay me a small salary? My salary would be at normal rates, so as long as my salary is low our family will benefit??? Seriously guys, (Trump, republicans, etc.) how did you dream this up??? What have we learned about the 2018 tax brackets? The main take away is that the brackets only tell a small portion of the story. Taxes are still complicated so that our government can continue to legislate their agendas through taxation. Were our system different, no lobbyist etc., we could possibly move to a postcard tax form. This tax bill doesn’t get us there, but it feels like a small step in the right direction. Will it spur economic growth? I’m thinking that they made it so complicated that the main growth will be in the accounting sector. Some of this growth may trickle down into the valuation/appraisal world as I have a feeling we are going to see a lot of asset transfers between family members to game the system. Half of the people don’t pay taxes, why do they bother with the bottom tax rate? Don’t get me started on this one. The people at the bottom are hurt the most by tax preparation companies, and their outrageous rapid refund schemes. That is something they should have looked at by giving the people at the bottom of the 2018 tax brackets a chance to fill out a postcard tax return. This was a complete miss by the republicans. Ross Landreth provides valuation services, you should not take any of this information as tax or legal advice.